Why choose ‘Microsoft Partner’ for next .NET Web Development Project? 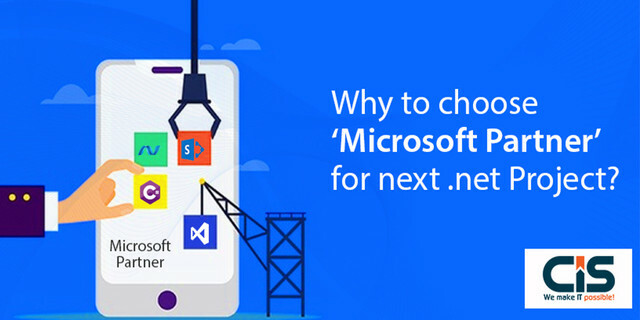 Why choose Microsoft Partner for next .NET Web Development Project? .NET is basically a software structure that has been developed by Microsoft and is mostly used in Microsoft Windows. The large class library included here is called Framework Class Library (FCL) which facilitates the property of interoperability in languages across several other programming languages. ASP is the abbreviated form of Active Server Page. In order to build up modern web-based applications and services, ASP.NET is used as it is an open source web-based framework. For doing this job ASP.NET contains different tools and functional properties along with programming languages and libraries. As the topic already suggests, it is very evident that we are here to discuss the reasons for which Microsoft should be chosen as a partner for the next .NET project. When it comes to operating systems, Microsoft has been the first choice, so much so that it has almost made other contemporary operating systems obsolete in today’s date. Microsoft has made several innovative signs of progress and modifications in order to facilitate easy use of Operating Systems. Although due to different controversies, Microsoft has not yet gained the title of the easiest operating system, it has been accepted by software developers and analysts across the world that Microsoft stands much easier than operating systems like Unix, Linux, etc. Due to its easy and speedy operating facility, Microsoft has become a worldwide popular choice for personal users, business clients, offices, game studios and what not. So, if .NET joins hands with Microsoft, there are high possibilities of reaching out to a much larger section of people and hence spread the product of this new project. Microsoft has its own help desk section. So it has a high quantity of online documentation which includes books, journals and papers on all versions of Windows. All these materials are available online and offline as well. Moreover, a wide range of YouTube videos rules the genre of cyber videos that help in problem-solving and concept clearing in the operation of Microsoft. These days, almost every house has a technical geek who is entrusted with the responsibility of solving any problem when it comes to laptops, computers and mobile phones. These problems might be related to hardware, but in most of the cases, software problems dominate the list of bugs. Keeping in mind, the scenario of exceptional cases, Microsoft keeps in mind the need for technical helpers from the house of Microsoft itself. Hence, among the annual recruitment programmes, Microsoft also caters one of its certified training programmes with utmost importance and strict evaluation. This training is nothing but the training programme for Microsoft Technology Associate (MTA). This training provides professional training mainly on different Microsoft products. Fundamental training is also provided for different other additional concepts which include Databases (MSSQL Server), development of Visual Studio and infrastructure related to Information technology. Visual studio is embedded within the system of .NET. It is compiled and run on Windows itself. Language Integrated Query (LINQ) facilitates the user to write queries directly without the need of using procedures which are already stored. Switch case is a common phenomenon when it comes to programming. But, most of the programming languages do not feature the application of switch cases in strings. Supporting native generic data, C# acts like one of those rarest programming languages which enable the use of switch cases in the string. .NET as we already know is a framework which concentrates more on Windows and its different versions thereby supporting languages like C#, C++, VB. NET. The unified environment provided by Microsoft facilitates .NET to exercise scalability. Scalability opens the road for all IDEs and other tools over the entire Microsoft Windows platform. Limiting the object-relational support is one of the most troublesome disadvantages of .NET. The support of .NET is available only for entity frameworks, which restricts its wide range uses and applications. Dependence on the updates, properties and facilities of Microsoft sometimes becomes a serious threat to the .NET framework. Microsoft enables easy functioning of the facilities of .NET. Moreover, Microsoft Virtual Academy provides the opportunity of gaining a good training on Microsoft app development. Apart from app development, the forum Microsoft Virtual Academy provides training on a wide range of topics that extremely essential in today’s world for most of the cyber maniacs. These topics mostly include advanced analytics, big data, business intelligence, C#, Extensible Application Markup Language (XAML), cloud app development, database administration, development of database, DevOps, security of enterprise, game development, HTML5, hybrid cloud, hybrid cloud automation, management of identity and access, IT showcasing, licensing, PowerShell, private cloud, mobile app development, mobile app management, server infrastructure, quick start challenges, virtualization, web development and SQL Server. Learning to code, reigning in the cloud, and validation of skills are great things to start their cyber journey with Microsoft. This not only opens great scopes for good placement in future but also nurtures the possibility of gifting the world with best web app developers whom the world of IT industry shall look up to in the near future. And finally comes the most significant reason for .NET to choose Microsoft Windows as its partner for the next project. In order to know this in more depth, one can surely visit Microsoft Virtual Academy at mva microsoft where there is a tab of training in ASP.NET Core for the beginners. It is not needed though to explain the relevance of this option here. Yet, for those who couldn’t catch the importance of this point, it’s just that a company who facilitates the training of a software framework, announces without saying, that they are able to handle the requirements of ASP.NET in a much better way as compared to any other option that might be available in the cyber market.